An auto mechanic is someone who performs regular inspection on light trucks and automobiles while also doing diagnostics and repairs. His duties involve inspecting, servicing and repairing the brakes, engines and any other parts of trucks, buses, cars and any other type of automobile. Routine maintenance is also executed by them to prevent cars from experiencing future breakdowns. The role of an auto repair expert is extremely vital in maintaining the good condition of one’s car. While there are other car owners who regularly visit mechanics to keep their vehicles running, there are also others who only visit them when their cars are already starting to indicate some signs of malfunction. When it comes to the preventative maintenance of vehicles, note that there are a few misconceptions to it. One is that certain parts of the car should be replaced on a scheduled or regular basis to prevent more expensive damages. A lot of car owners find it hard to understand why they need to spend something for the regular replacements of the parts when these are not yet damaged. A person who has already received his auto mechanic certification is also fully aware about fixing cars regardless of their make, model and brand. He should know exactly how to diagnose car problems quickly and accurately and provide effective solutions. When it comes to inspecting and fixing vehicles, the mechanic takes advantage of electronic equipment and his senses in gathering data. High-tech devices are also used in aligning tires and in lifting cars off the ground to improve access. If you want to know everything about detecting car problems and efficiently fixing them, then the auto repair certification program from Brainmeasures is highly recommended for you. 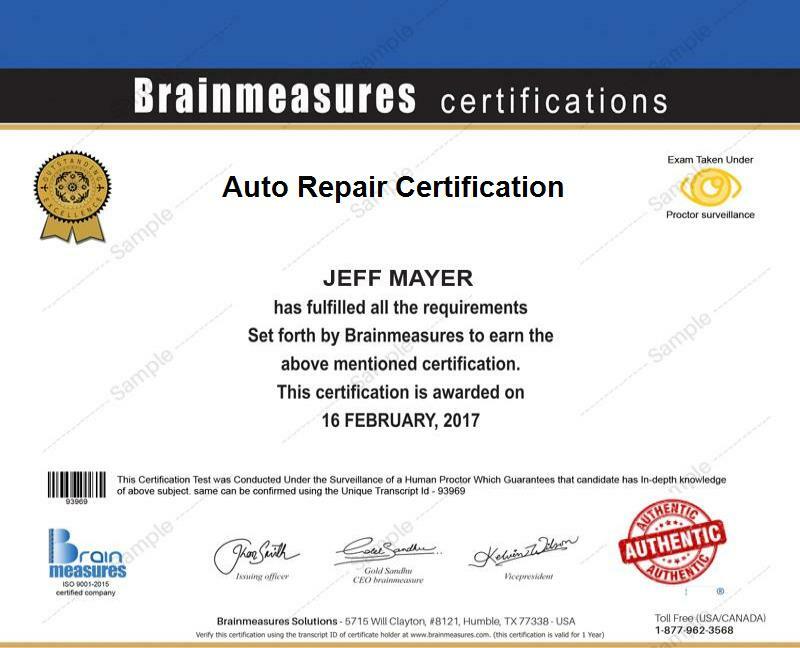 Brainmeasures is popular for being the most reputable online certification company at present which is capable of providing the participants of its programs with high quality information and reliable certification so you can expect to receive all these by taking up its auto repair course as well. The auto repair training which you can get from the program is wide enough that you will get the chance to fully understand everything about repairing cars including brake repair, alignment and suspension, steering, electrical systems and improving the performance of engine. Deciding to get your auto technician certification from Brainmeasures will also allow you to handle all types of car problems and understand all their individual automotive systems and electrical components including their transmissions, fuel control systems, manual and automatic drive trains and their brake systems. Once you finally receive your auto repair certificate, you get the chance to finally help car owners deal with all the problems that they have with their vehicles. The comprehensive auto repair certification program which is now available at Brainmeasures can help anyone who wishes to gain a full understanding about the things that they can do to efficiently repair car damages. This is a good program for you if you are a car owner who wishes to understand the many things that you can do on your own to maintain the good condition of your car. This is also suitable for aspiring auto mechanics or anyone who wishes to set up his own auto repair shop. Auto repair certification holders will definitely enjoy their job considering the fact that this will allow them to receive a more stable salary. At present, certified auto technicians can earn around $15 to $25 per hour. According to Payscale.com, auto repair certification holders also earn bonuses of around $2,000 to $3,000 per year. If you are already an experienced technician, then you can further increase your earnings through commissions since there are independent repair shops and automobile dealers out there that offer commissions to their technicians based on the total labor cost paid by their customers.